GSD agility training for both you and your German Shepherd can be lot's and lot's of fun. If you've never tried GSD agility work, or as I like to call it "play", you're missing a lot of fun. Don't get me wrong, though, it is also a lot of hard work, but well worth it. Much like a combination Doggie Obstacle Course, agility training is comprised of multiple types of various obstacles that the dog must complete. The dog sport of agility was originally developed by combining the sport of stadium jumping (with horses) with many of the different challenges that are unique to dogs. The most important factor in this type of "work" is enthusiasm and positive reinforcement. Why should the dog cross the high walk or go through that collapsed tunnel? It is your job to convince your German Shepherd during agility training that it is okay to follow commands and that nothing will harm it by completing the agility obstacles. Strategy from the handler to get their GSD from the beginning of the course to the finish through an array of obstacles and within a limited amount of time is very important as well as the ability to correctly complete the agility course with as few mistakes as possible. 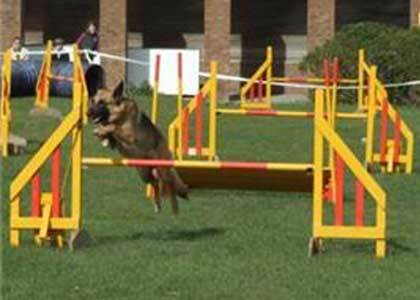 Many German Shepherd dog agility training clubs have arisen due to the popularity of the sport and often times German Shepherd owners can take their pets to an agility club for a "trial run" before actually becoming a member. Agility training courses run the gamut in obstacle type, order and length. Many benefits are available as a result of this type of GSD agility training. Not only does the German Shepherd get a lot of great exercise (as well as yourself), but other benefits such as socialization skills from being around other people and animals.The agility trained German Shepherd learns body awareness skills - such as, its back feet are independent of the front which many dogs seem to be unaware of.German Shepherds acquire a new ability to accept challenges and stamina to follow through in many new situations. One of the most important things is that your German Shepherd agility training teaches your dog to trust you as its leader. As a teacher you learn new ways to motivate your dog during dog training and new ways to get it to perform as you wish while going through the agility obstacles.Beginning Agility Training can begin at the puppy level. It is best to remember, however, the ability levels of the growing puppy and not to put it in any situation that may result in any type of problem for it in later years. Remember those growing bones and joints even if the enthusiasm is abundant. I recently have witnessed dogs that are so turned on to the weave poles or collapsed tunnels that they keep going through them again and again - much like a teenager riding a roller coaster over and over again.You can bet they probably weren't so excited their first few times when practicing agility. 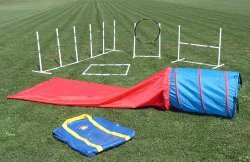 This is the German Shepherd agility training obstacle you must overcome with each new obstacle learned, especially in the beginning of agility training. Motivational tools are different for each dog - food, a favorite toy, or a hug from you. Only you know what gets your German Shepherd working. 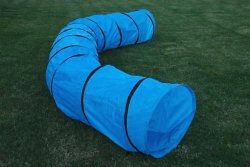 Use that knowledge to your complete advantage in new agility dog training procedures. Many books are available on the subject of agility and training the German Shepherd. If you are interested in more information, contact local dog clubs and trainers who can put you in touch with the appropriate people.